Stair lifts are a type of mobility aid that is used to carry a single individual to the top or bottom the stairs. The majority of lifts use a chair, which is connected to a metal track. The track is in turn secured to the steps or to the wall and the chair is sent up and down the track. Purchasing and installing a stair lift for a straight staircase can be done quickly and for a rather low cost, but if you don’t have a straight staircase, this process is not so straight forward. There is no uniform standard that is used when constructing a curved staircase and so, the degree of the curve depends on the design of the house and the builder. Since there is no standard, an in home estimate will be required. They will also need to measure the stairs for you because the stair lift will have to be custom made to the specification of your stairs. Often it takes around six to eight weeks for the unit to be constructed and then it must be installed by the stair lift company. They tend to be much more expensive than a straight stair lift and depending on the company, they can cost well over $15,000. If you have a curved staircase, it is a good idea to get several estimates. By doing a little bit of shopping around, you can save a good amount of money, but remember the company will have to come to your home to provide you with an accurate cost of the curved lift. Typically a curved stair lift does not have much resale value, because it will only work with an identical staircase that has the same degree curve. Many people have an ‘L’ shaped staircase in their home. An ‘L’ shaped staircase is basically two straight staircases that have been put together and generally, as do curved staircases, allows for a slightly wider set of steps. If you have a staircase that is shaped like an ‘L’ and has a landing in between, then it might be possible to install two traditional straight lifts as opposed to installing a single curved stair lift. Going this route will save a lot of money and will allow you to be up and running in only a few days. However, when you reach the landing you will have to switch stair lifts if you go this route. There are also several curved stair lifts available that are designed specifically for an “L” shaped staircase. 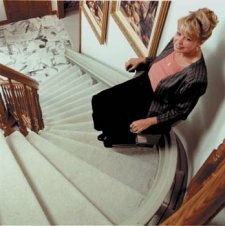 These models can be used on staircases with landings and those without.These types of stair lifts are less expensive than a custom built curved stair lift, but usually still cost more than a double installation would. The advantage is that these can be installed rather quickly, but they will only work with certain types of “L” shaped staircases. My mother has a curves set of stairs. We would require a lift from the basement garage to to the first level. In the middle of the stairs is a landing where the front door opens up. Would we need to get to lifts, one from the garage to the landing, and one from the landing to the living level of her house. My question is do they make some type of folding track that folds up when not in use. This way we can use the front door. Please let me know. Jeff, that is an excellent question and I shot you an email, with some more info. One option would be to go with a Bruno Stair Lift that has the ‘Flip-up’ folding rail option. These types of stair lifts are designed so that the bottom or top portion of the track can be folded down, to save room. This way, you can fold the track out of the way and use the door. To my knowledge, Bruno is the only stair lift manufacturer offering this feature right now. Bruno also makes a number of stair lifts for staircases with 90 degree bends or landings, which can be used on an ‘L’ shaped staircase. it is a good idea to compare prices, because a Bruno stair lift is often less expensive than a double stair lift installation and is much more practical. My husband requires a stair lift due to mobility issues related to MS and a brain tumor. We have a split level home with five stairs and then a 180 degree turn to the last 8 stairs. Would this require 2 separate lifts to be installed? This is the first time I’ve gone online to research lifts, so any info. you could provide would be appreciated. Thank you! my friend has a split level home with a straight stair from the lower level to the front door and then a stair from the front door landing to the upstairs. the problem is that their is a 180 degree turn at the front door landing before you can go upstairs. what would you recommend, two separate lifts or some type of curved lift with a 180 degree turn at the door landing, or something else. Stephen and Karleen, I apologize for not getting back to you sooner. 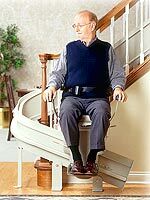 I hope it is not too late to offer you some advice on what type of stair lift will work best with your stairs. When you have a bend in your staircase, often a two stair lift installation is the cheapest route. However, it requires that there is a landing where the bend occurs. This is because there must be enough room to install both stair lifts, as well as providing a safe place for the user to transfer from one stair lift to the other. The same is true of a 180 degree bend or a 90 degree bend, if you want to install two stair lifts. The two stair lift installation can be much less expensive, but it can be a hassle having to switch stair lifts each time you use the staircase, instead of doing it all in one shot. So, while a two stair lift will probably work on your stairs, I would recommend exploring some of the other options available first, which are designed to work with these types of staircases. I need a stairlift for my 9-year old daughter who cannot walk. I have two stairs, then a landing, then a set of 10 steps that go straight up, then a landing, and then another 2 steps. Was the least cost-efficeint way to go? Latricai, thanks for your question. To be perfectly honest, there probably isn’t going to be a very inexpensive option, because of the multiple landings. With that said, you might want to check and see if any of the stair lifts offered by Bruno will work. There are a few Bruno Stair Lift Kits that are designed to work with landings, so you might be able to adopt one of them to work with multiple landings. I have a split level home, with 5 steps that lead into my kitchen. If you turn sharp left there are the steps that lead upstairs to the bedrooms,they have about 8-10 steps. Is there a way a continues chair lift can be installed for my son that does not walk ? Theresa, I think I understand your floor layout, but would really need a little more description to be certain. With that said, it sounds like you would probably need a custom inclined stairlift. There are, however, a few hurdles that would likely make this expensive. Also, the track may need to extend into the kitchen, in order to allow enough room to turn. So there are space concerns. There may be a do-it-yourself stair lift kit that you could get to work, but probably not without some customizations, which should not be done by a regular homeowner. I think your least expensive option would be to install two stair lifts, one for each staircase, although this can add a lot of clutter. Otherwise, you will need to contact a company that does custom stair lift installations. When you get an estimate(s), you should also get an estimate for a residential elevator. You might find that the elevator is not significantly different in price, while offering a much higher value, both in regards to home-value and functionality. My father is going to have to have a stair lift. We will be able to design the stairs to meet the requirements of the lift, but I’d like to try one out before we make any major decisions. Do you know if there is one in our area that is avaliable for a test ride. I live in the 35674 zip code are. Thank you. Tambra, I do not know of any specific medical supply companies in Tuscumbia Alabama, however you can probably find a place that has a stair lift setup to try. I would recommend starting by calling some of your local home medical suppliers. Even if they do not have a model stair lift setup, they may know of someone who does. You also may have luck looking for a company that installs stair lifts, as they may have a model stair lift. 1. What is the smallest width staircase that can accomodate a chair lift for a handicapped person? 2. If staircase is very small, are there solutions for handicapped person so she doesn’t have to leave her home? 2. Split level home: Landing with 8 stairs going down to first floor. Parallel staircase from landing that goes to second floor. 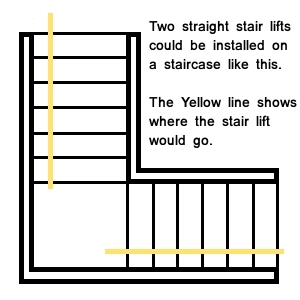 Any possiblity to use one stair lift for both staircases? What is best option? Hi, I have basicall a U shaped shtairs or a double “L” where you have like 5 stairs, 1/2 landing step up 1/2 landing to the right there are then 5 more stairs the a full sized landing and the to the right another 5 stairs…our local medicaid will pay up to $10K for it to be modified for my mom to get upstairs as she has not been up to sleep in her room or to even shower in nearly 2 years is there a possible way to get this done in th $10 allotment we have? She is very unstable to try to stand on the partial landings by herself….we were told three tracks and three chairs but I am unseasy and afraid she’s going to fall down. What is your suggestion? Thank you! Rose, I would also be very weary about using three different stair lifts on a curved staircase. You are correct that this significantly increases the risk for a fall. Whenever possible, it is best to use only a single stair lift, although this is usually the more expensive option. I would definitely check out some of the Bruno options, as well as a few of the other semi-curved staircase lifts. Typically, as long as it is a square turn, you can find a stairlift kit that will work. My husband [turning 72 in November] has muscle problems. We needed a large house for our Library and computer rooms, etc. Our new house is 2 story. We are intently seeking a inexpensive stair chair lift to negotiate 10 stairs, turn 90 degrees to the left, then rise 6 more steps to the top floor. thus far we have been met by price quotes in excess of all of our arms and legs combined!! Rather than use 2 straight lifts, why not simply purchase THE PIECE OF TRACT THAT TURNS THE 90 DEGREE CORNER, attach each end to 2 straight tracks, and be done? Why is this such an expensive notion? If we COULD afford one continuous straight track and it malfunctioned at the curve, obviously the curve would have to be REPLACED, under warranty. So, why can’t we simply buy 2 straight tracks with the connecting curve, bolt the mess to our stairs, and go live in our new home FOR A REASONABLE PRICE??? Do we have to sell the new house or exist with 2 seperate chair lifts????? Supposedly some in our county discontinuing use of stair lifts are even disassembling then and putting the whole mess out on their curbsides for trash pickup!! Do you resell any such??????? RJ, I am sorry to hear you are having difficulty finding an affordable curved stair chair! Unfortunately, connecting two straight stair lifts together using a piece of track that you purchased or fabricate separately will probably not work. There are several differences between how a straight stair lift and a curved stair lift move along the track. As a result, it would probably not work in the first place and certainly not be safe to do this. Even if it were possible to piece together two stairlifts together in this manner, you would need to pay very close attention to the curve of the track, in order to make it work. So, it would likely need to be engineered. Usually in these sorts of situations, I suggest looking into getting a residential elevator. It will often end up being less or, at least, comparable in price to a complicated curved stair chair setup, while offering a lot more value to your home in the long run.